The Ford Fusion comes with a five-year trial of SiriusXM Travel with Travel Link, all controlled through a voice-activated touchscreen. You get 150 channels of commercial-free sports, news, entertainment and exclusive content. More and more drivers are spending extended amounts of time behind the wheels of their vehicles for a variety of reasons. Many of these drivers are forced to drive when tired or fatigued, and as such, it can be easy for such operators to lose focus or even fall asleep behind their steering wheels. Such situations can obviously lead to serious accidents, but the good news is that the experts at the Ford Motor Company have come up with an effective antidote to this syndrome. You'll have good control over the vehicle while driving downhill because of diesel engine exhaust braking. Even with heavy loads, this feature works to improve control you have over the truck. Diesel engine exhaust braking works by limiting the turbocharger's exhaust flow. If you are interested in the Ford Escape, it is a popular model at our dealership because if offers a variety of amenities. At King Ford, we share a goal to keep our consumers informed about our vehicles, so we invite you to read about a few amenities that come equipped with the Ford Escape. We at King Ford love to show drivers the tech features in the Ford Edge. Driving around places like downtown or taking a long trip, there is technology for everyone in the Edge. The Edge is great for getting around and listening to great tunes with navigation, music, and apps. The Ford Ranger: What Technology Features Come With this Truck? Are you in search of a new midsize pickup truck? Our team at King Ford finds that the Ford Ranger is a popular truck with our consumers. The Ranger was made with advanced technology features that provide you with a number of benefits. Let's check out a few below. Ford Co-Pilot 360 is a new technology feature that is standard with the Lariat and XLT and available with the XL. Ford Co-Pilot 360 comes with a Blind Spot Information System with Cross-Traffic Alert, a Lane-Keeping System, a rearview camera, automatic high-beams, and Pre-Collision Assist with Automatic Emergency Braking. With innovation at the forefront of their 2019 model offerings, Ford's most popular compact SUV is the EcoSport, a vehicle ready to take on the challenge of the carpool or the open road with equal ease. Utilizing a range of capability features, the EcoSport assists the driver while also being kind to the environment. Two features that aid the driver are Hill Assist and Auto Start-Stop. When stopping on a hill, the brake automatically engages once the pedal is pressed and does not release until the driver presses on the accelerator. Many people are just content with a vehicle that does not drive against them. However, we at King Ford do no believe this is enough. We look for vehicles that will drive with you. We have found this type of vehicle in the 2019 Ford Escape with the technology features. Ford has designed the most advanced package of driver-assist technologies in the automotive industry with the Ford Co-Pilot360. This innovative package provides you and your passengers with excellent safety. Our staff at King Ford serving Murphy has a goal to keep our consumers informed about the new technologies that come with our models. Read further to learn more about the Ford Co-Pilot360. 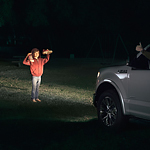 Pre-Collision Assist with Pedestrian Detection is available with the Ford Co-Pilot360. This feature helps you avoid frontal collisions with pedestrians and vehicles. Here at King Ford, we often assist Murphy families in finding a vehicle that is both practical and convenient. As a result, we often find ourselves pointing people in the direction of the new Ford Flex. 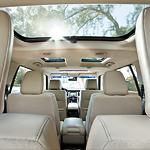 This three-row midsize SUV is simply packed full of convenience features to make every day a little easier.